It’s a market in one of the strip malls at the corner of Dogwood and Oak Road, the side that has the Sonic and the Bank of America, and behind the old Blockbuster. It’s now one of four in a chain. 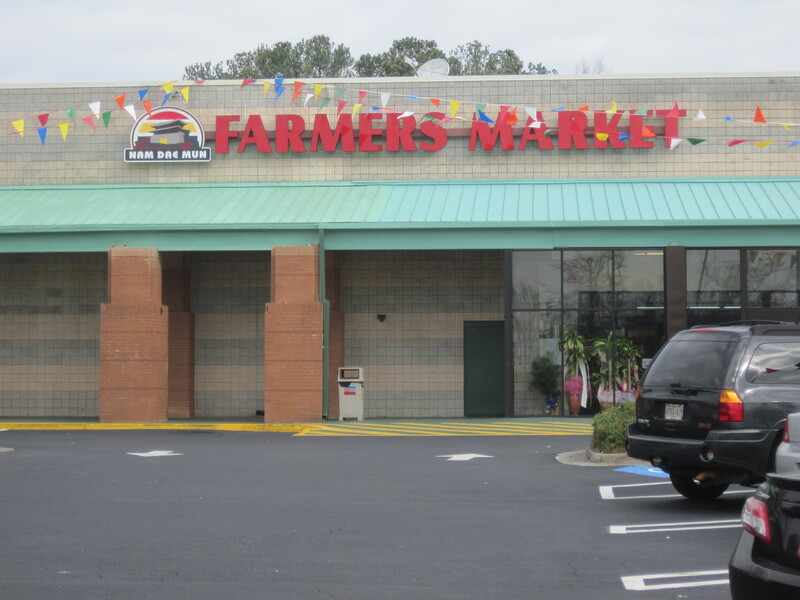 Two of the others have been reviewed here previously, as Gwinnett International Farmer’s Market and Lilburn Farmer’s Market. That should give you some clues as to what they do, and what they do well. For those wanting more recent discussion, there is an active thread on 285 Foodies discussing the chain. Virtues here will be seen mostly by large families. The meat prices are staggeringly low. 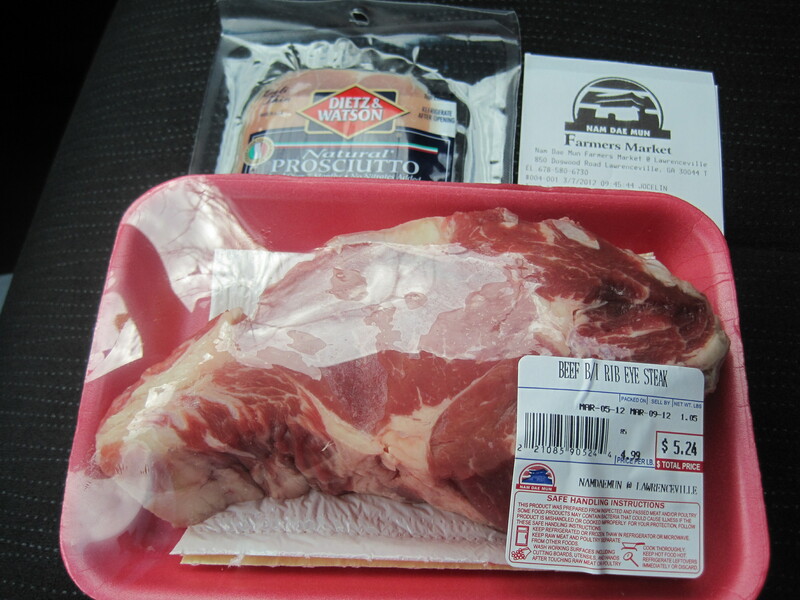 I saw good looking T bones at $4/pound, a ton of other meats in the 3 dollar per pound range, roasts in the 2/lb range. Chicken breasts are about half the price, per pound, of the local chains. A considerably larger supply of offal – organ meats, chicken feet, bony cuts, ox tails, etc, is available at Nam Dae Mun than other stores. Meats can be incredibly inexpensive at Nam Dae Mun. There are butchers, under the "Seafood" sign, who can cut up meats for you. There is a European section, with Swiss and Croatian chocolates and Russian pickles, and an Asian section, with a ton of useful sauces (yu xiang sauce, for example, and perhaps 10-20 different kinds of Kikkoman products). I saw plenty of Caribbean spices and condiments. There was durian and jack fruit – huge things. There were plenty of red jalapenos, sugar cane, Korean sweet potatoes (asian yams), habaneros, exotic spices. Silky and firm tofu were available for about $1.60 a container. There is a bakery. Though pretty modest, they are selling cookies and Danish that look useful. There is a seafood section. Among other things, they have live catfish and live lobster for sale. Maps to the various locations can be found here. It is good to have a resource like Nam Dae Mun Farmer’s Market only several miles from the house. I will be cautious buying meat and sometimes seafood from there, but I am a good shopper and know my way around a market. Good Blog post. I suspect they achieve a lot of cost savings by using meat at grades below “choice”. Net effect is NDM’s meat will tend to be leaner and have less marbling. You can compare the picture above with the picture of a prime cut of meat here, and make up your own mind. At grades below “choice”“select”, there is no premium for meats. Interestingly, grade “standard” tenderloin was a popular fajita choice in the Houston area, as Robb Walsh has noted. PS – nice photos of marbling and Kobe beef are here. The tenderloin they were talking about wasn’t the Prime or Choice stuff you eat in fancy steak houses. Matt’s Rancho Martinez uses USDA Select, while Joe T.’s uses ungraded tenderloin. Below USDA Prime, Choice and Select, there are the USDA Standard, Commercial, Utility and Canner grades. You never see these in restaurants or grocery stores, but that doesn’t mean you aren’t eating them. USDA inspection is mandatory for all meat plants. Most people assume this means all meat is graded — it’s not. USDA grading is a service that meat processors can elect to pay extra for. And it costs a lot of money. A Prime, Choice or Select grade brings a bonus price; lesser grades don’t add anything to the bottom line. Meat packers don’t waste money getting older or less muscled steers graded. But the meat still gets sold. It’s called ungraded beef. Ungraded tenderloin, known as cow tenders in the meat trade, is relatively cheap and very tender. Compare the price of ungraded tenderloin or sirloin to USDA Choice inside skirt steak, and you begin to understand that meat quality is not as simple as the labels make it seem. I live nearby and stopped by on opening day. I did not buy meat, I did buy veggies and fruit. Strawberries and tomatoes had gray mold the next day (but not when bought). But apples, bok choy, onions and other veggies were fine for several days (till used). The few bakery and pantry items we bought were good. Prices similiar to Assi or Great Wall. Checkout was fast. I won’t hold the strawberries and tomatoes against them, I’ll just check better and clean the tomatoes faster, I’ll be going back. 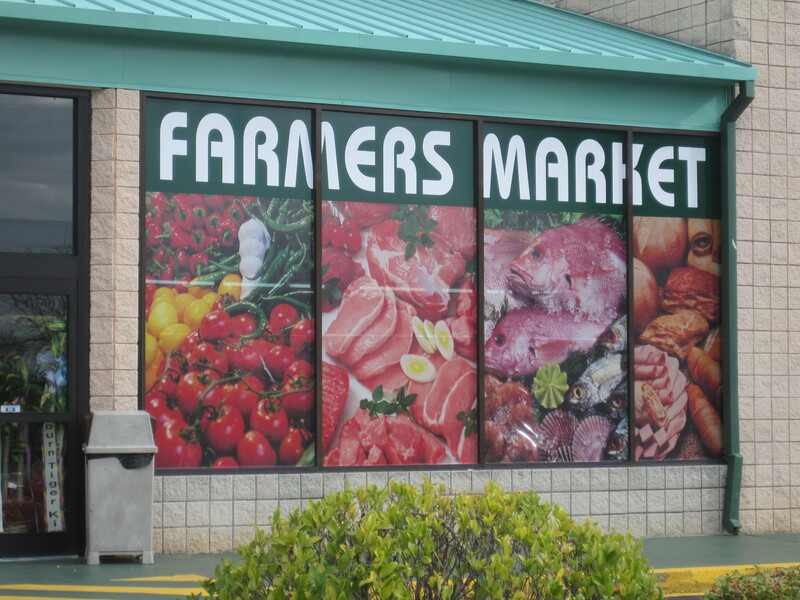 i have been waiting for SO long for a farmers market to come to snellville. the ride over to 85 every week was getting SO old..
will your store post weekly ads online any time soon? I was there first time today. Produce looked awesome. Large selection. Store was clean and plenty of staff. I hope to shop there often. Please change the phone number above. 678-380-6730 is the phone number to guitar center. This would be a great service to the farmer’s market customers as well as guitar center. This phone number must be the only mention of this farmers market’s number on the Internet. Thanks! Actually, the number is also listed here, but we have updated the article with the correct phone number. I have shopped there several times and have learned to avoid their watermelon, advacados, cantalope, apples, and other fruit that bruise easily. A lot of these items have been bruised so badly that they are not edible. Last time there, I saw why: Two muscle-bound stock boys were showing off by tossing the melons about 10 feet then dropping them in the bins. Another was tossing the advacodos into the bins like baseballs. I tried to explain to them that they were ruining the fruit, but apprently they did not understand English. The other produce that can’t be bruised, like grapes & corn, are good buys. The meats are good buys if you know what you are getting. I wanted some fround chuck, 90% lean, but they do not put the percentages on the labels, so they lost a sale. I was impressed at how clean the store is. 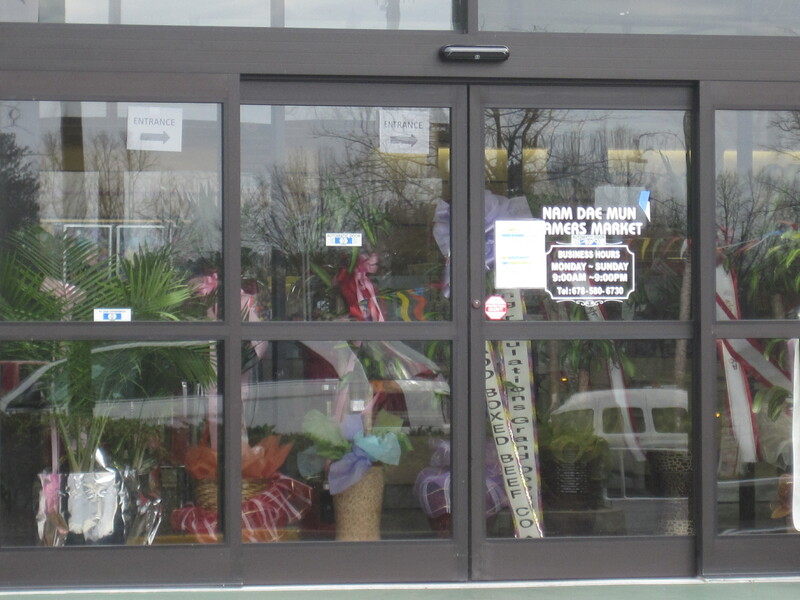 I waited a long time for the store to open. I love that place. I found no fault in 10 shopping sprees. I live in Birmingham and when in Atlanta, I’ve shopped here twice and have enjoyed my purchases. It was well worth the trip. The produce, I have to admit is my favorite department due to the freshness and taste of the several items I’ve tried. While in the meat department I was very pleased to find smoked turkey tail at a reasonable price (which I used to season the fresh greens I also purchased). I like the bakery goods there. It has different selections that the other grocery stores close by. Some of the fruit that is lower price reflects the quality, but sometimes they have great deals on high quality fruit. I bought tomatoes for canning, and the other supermarket did not have enough quantity and not as low a price. The shrimp they sell were of very high quality, I have bought them several times.